Gunpla can be as solitary or interactive as you want it to be. For people looking to make friends while they make Gunpla, in-person Build Days can add a social facet to the hobby. 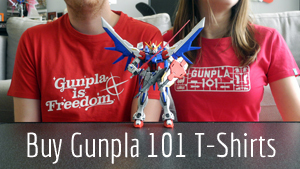 Contributor Megaplamo shows you how to get involved with your local Gunpla scene. From the model kit displays at Barnes & Noble to the surprisingly relatable references of Anime Crimes Division, Gunpla is making its way to the mainstream. One thing the hobby has now—that it didn’t have when I was a kid—is a social aspect. Building models kits used to be a purely solo hobby. But now with social media interactions, competitions, and even in-person events, it’s so much easier to meet people who love building Gunpla. Perhaps one of the best things to come out of Gunpla’s rise in popularity is a regular event called Local Build Days. Local Build Days are a great opportunity for model makers and fans of Gunpla to step away from their workbenches and meet the other people who like building miniature giant robots, too. They give modelers the opportunity to meet people who not only appreciate, but understand the time and effort you put in your work. These events can help beginners get started, or intermediate builders learn new skills and techniques. Best of all, they let you make new friends who actually know what you are talking about! I discovered my local build group by checking my city’s hobby shop’s Facebook page, where they offered build space and a 10% discount to people who joined the group. Once I signed up, it was easy to make friends. Today, there are around 20 members and their ages range from 17 to 30. I live in a small city in Alabama, so most of us were very surprised at the turnout and that so many local people were interested in Gunpla. All it took was the opportunity to meet up. After I began attending regular local build days, one of the most interesting results was that I became a better builder. Build events are especially great for new builders to learn where to start, what tools to use, and how to copy that cool weathering effect they saw online. If you’re a visual learner, getting together means you can see that skill in person. In my group, I learned plenty about the individuals in my local community and their unique building styles. One builder showed us a silver weathering technique and I showed others how to remove nub marks and use a cutting mat while I worked on a Blue Destiny Unit 3 and Zaku FII. Most model making communities are very positive and love sharing tips and tricks: all you have to do is ask. Check Facebook. Look for “City Name” + “Gunpla” or “Model building” and see if there’s a community near you. For example, Gunpla Montreal, Gunpla Brisbane Build Group, Gunpla Builders of Chicago, or Mississippi Gundam and Gunpla Group. Try Meetup’s Gunpla section. There are groups everywhere from Quincy, Massachusetts to Singapore, and plenty of interested modelers located all over. On Reddit’s r/Gunpla, members are keeping a list of all the local Gunpla groups they can find all over the world. The thread is archived but still pretty extensive! If your town doesn’t have a local Gunpla or model building group, then I would like to encourage you to start one. It’s as easy as creating a Facebook group. Once you have a group you can then find a place to meet. Depending on the size of your group, I would recommend asking your local hobby, comics, or games shop if they would allow your group to meet on one of their less busy nights. If the shop agrees, be sure to encourage your group members to make a small purchase to support the business that is kindly sharing their space with you. If you own a hobby shop, starting a build day is a great chance to promote new model kits and find out which of the new kits local builders are most excited about. The more builders come together, the more opportunities we can create to expand the hobby. It can be easy to think “All the cool stuff is happening in another city or country.” But the truth is that it’s people who make places exciting, not the places themselves. Most of the builders I have become friends with were completely unaware of the local and online communities and I have noticed that it really changes the hobby for them once they make the discovery. Chances are that if you have a hobby shop in your city, you have a community of Gunpla builders, too. All it takes is for someone to reach out. Megaplamo has been building plastic models since 2001. When not building he plays the guitar, bikes, and travels. He lives near the Gulf Coast of Alabama where he and his wife are teaching their two cats to become productive members of society. You can follow @megaplamo on Instagram for current projects, completed projects, and Gunpla building tips.